Now we head down the hallway towards the bedrooms. The doorway on the immediate left leads into the utility room, where a washer and dryer will someday come to roost, hopefully. The doorway on the right is the front bathroom. 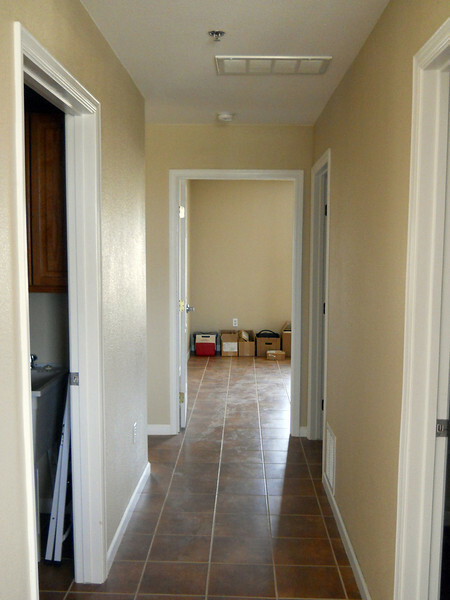 Moving down the hall, the doorway on the left leads to the master bedroom and back bathroom. The doorway on the right is the mudroom and back door. And lastly, we're looking straight into the second bedroom, which I'm turning into a storage room for all my stuff in storage in Alpine, slowly but surely. Boy, somebody needs to clean this floor.